Full Day (easy to moderate) — Jasper Hikes & Tours Inc.
*PICNIC LUNCH CAN BE PROVIDED FOR AN ADDITIONAL FEE WITH ADVANCED NOTICE. This lovely trail link-up takes you from the unsurpassable Maligne Canyon past a parade of turquoise lakes to end at Old Fort Point (optional climb to Point summit before returning to town) or finish the hike back to town. We shuttle the vehicle so it’s one-way! This trail link-up can easily be the highlight of your trip. Very adaptable loop depending on interests, ability and time. No shortage of views, flora, fauna and history. A great way to stretch your legs, see some stunning turquoise lakes, meander along a river and see a bit of Jasper’s trails. Can finish at Old Fort Point or in town. An historic Jasper trail with fabulous views, flowers and a remote feeling. We shuttle the vehicle to make it one-way! 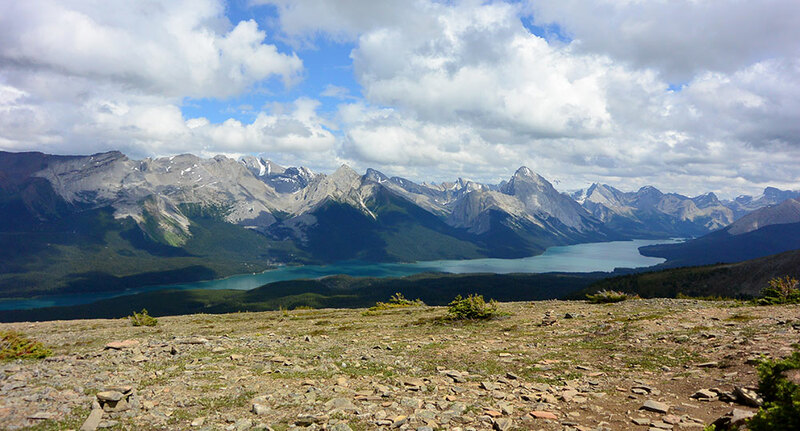 This steep trail takes you to the alpine with fabulous vistas of the Miette and Fiddle ranges. We allow for time to soak in the Miette Hot Springs post hike ($6.50 admission), bring your swimsuits! This popular trail starts on an old fire road at Maligne Lake. It is moderately steep in places and spectacularly beautiful in views in the alpine. A favourite.